This document is our comprehensive unincorporated association agreement in its simplest form. It includes all relevant provisions; however, you will not be able to hold property nor an alcohol license. 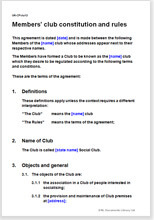 It is an all-embracing agreement suitable for any type of association and will be suitable in almost every situation. We have templates for specific types of unincorporated association coming soon. If your venture has standard, logical, common place rules and procedures, this document will be suitable. Similarly, if you have extraordinarily unusual rules and procedures, you will benefit most by buying this document and amending it to fit. Whenever you set up a new unincorporated association, or when you are a member of a current one which could benefit from a formal agreement.